Michael Barr and Joe Valenti (Center for American Progress) penned a Fortune op-ed: “How the CFPB fight is a sign of the next financial crisis.” Barr also wrote an op-ed in American Banker: “Dear Congress: Reg relief bill is a giveaway for large banks.” In December, Barr participated in a roundtable discussion with Detroit Mayor Mike Duggan, the W.K. Kellogg Foundation, JP Morgan Chase, the Kresge Foundation, and others to announce significant new investments in Detroit’s Entrepreneurs of Color Fund (EOCF). Barr was one of the architects of the EOCF, which launched in 2015. Alan Deardorff’s chapter on “Comparative advantage in digital trade” appears in Cloth for Wine? The Relevance of Ricardo’s Comparative Advantage in the 21st Century (ed. Simon Evenett). Deardorff served this academic year as the interim director of our BA Program. Susan Dynarski testified before the U.S. Senate Health, Education, Labor & Pensions Committee on “Reauthorizing the Higher Education Act: Financial aid simplification and transparency.” Dynarski’s testimony included insights from her research on the U.S. student loan market and potential improvements to make borrowing work for students. In the New York Times, Dynarski reviewed the evidence on online courses and using laptops in class. 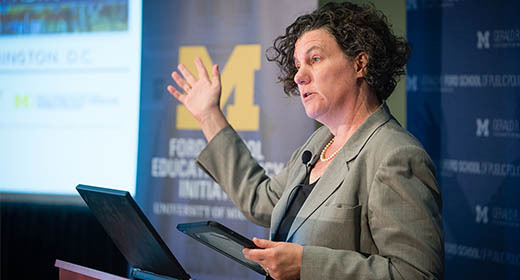 Principal Investigator Elizabeth Gerber and colleagues have received a $761,000 award from the John S. and James L. Knight Foundation to support the Detroit Metropolitan Area Communities Study (DMACS). The study collects opinions from residents across Metro Detroit—reflecting the region’s diverse communities—to help local leaders craft programs and policies that respond to community needs. In Health Affairs, Richard Hall and Peter Jacobson (University of Michigan) wrote about whether the health-in-all-policies approach promotes health equity (p. 25). Hall participated in a briefing hosted by Health Affairs about the new research at the National Press Club. In April, Yazier Henry gave two invited talks. He delivered The Peace and Justice Studies Lecture at Michigan State University. And he was part of a panel called “Peace in the World” at an International Congress hosted by the Avanza Colombia Foundation in Medellin, Colombia. Paula Lantz was elected to the National Academy of Social Insurance in recognition of her distinguished work on poverty, income assistance, and Medicare. With Samantha Iovan, Lantz published “When does pay-for-success make sense? Seven criteria for assessing whether an intervention is right for pay-for-success financing” in Stanford Social Innovation Review. Stephanie Leiser wrote “Taxpayers want more fairness. GOP plan to ‘reform’ the tax code doesn’t deliver” for The Conversation. In January, Leiser participated in a packed Town Hall forum on tax reform hosted by U.S. Congresswoman Debbie Dingell. Melvyn Levitsky appeared on “Detroit Today with Stephen Henderson” for the podcast’s episode on “Mueller charges and what they tell us about investigation.” Levitsky has been widely interviewed by press for perspectives on Russia and U.S.–Russian relations. CLOSUP postdoc Sarah Mills’ research on wind development in Pennsylvania appeared in Commonwealth and her chapter analyzing “Wind energy and rural community sustainability” was published in the 2018 Handbook of Sustainability and Social Science Research. With Barry Rabe, Mills described “State energy policy in the Trump Era: Insights from public opinion” in the Journal of Environmental Studies and Science. Two faculty members were recipients of Poverty Solutions’ 2018 Faculty Grant Awards. Shobita Parthasarathy’s project, “The politics of technology for the poor: Between India and the world,” investigates the impact of technology on poverty alleviation. Kristin S. Seefeldt’s “Helping across generations: An exploratory study of blue collar workers’ retirement well-being” explores the impacts of intergenerational financial assistance. Natasha Pilkauskas explored “Maternal employment stability in early childhood: Links with child behavior and cognitive skills” with J. Brooks-Gunn and J. Waldfogel in Developmental Psychology, and “The magnitude and timing of grandparental coresidence during childhood in the U.S.” with M. Amorim and R. Dunifon in Demographic Research. Barry Rabe’s latest book, Can We Price Carbon? was published in March by The MIT Press (p. 16). Rabe was also appointed to a National Academy of Public Administration panel to assess the mission and functions of the Oklahoma Corporation Commission. Oklahoma Governor Mary Fallin requested an assessment through an executive order in August. Kaitlin Raimi published several papers, including “Putting your money where your mouth is: An experimental test of pro-environmental spillover from reducing meat consumption to monetary donations” with A.R. Carrico, H.B. Truelove, and B. Eby (Environment and Behavior) and “The influence of learning about carbon dioxide removal (CDR) on support for mitigation policies” with V. Campbell-Arvai, P.S. Hart, and K.S. Wolske (Climatic Change). Joy Rohde’s “Pax Technologica: Computers, International Affairs, and Human Reason in the Cold War” appears in Isis. John J.H. “Joe” Schwarz was honored by the Student Veterans of America at the University of Michigan (SVAUM) with a Lifetime Achievement Award at their 10th Anniversary Benefit Dinner in January. From 2007–2010, Schwarz taught and mentored the founding leaders of SVA, both at U-M and nationally. Chuck Shipan is this year’s recipient of the Midwest Political Science Association’s (MPSA) Herbert Simon Award. The award honors significant contributions to the scientific study of bureaucracy. Shipan delivered the Herbert Simon Award Lecture at the MPSA meeting in April. In December, Janet Weiss was appointed to a panel of the National Academy of Public Administration that will, as requested by the U.S. Congress, conduct an organizational assessment of the NASA Advisory Council. The Council provides consensus advice and recommendations to the NASA Administrator. In January, the Arts Alliance presented its 2018 Philanthropic Excellence Medal to Marina V.N. Whitman and her husband, Dr. Robert F. Whitman. The award recognized the ways in which their “stewardship and generous investment of talent, time and treasure has guided the Great Lakes Performing Artists Associates, the Michigan Theater, Artrain, the Sterns Collection and many other organizations.” Whitman retired from the U-M faculty in 2017. After more than 30 years in Ann Arbor, she and Bob moved this spring to Concord, MA, to be closer to their children and grandchildren. Two outstanding scholars will join the Ford School this fall as assistant professors, both with expertise in international development. Yusuf Neggers is a postdoctoral fellow at the Watson institute for international and Public affairs. he received a PhD in Public Policy from Harvard University, and also holds an MSc in international Political Economy from the London School of Economics. His research examines questions at the intersection of development economics and political economy, with a particular focus on the connections between political and bureaucratic accountability and the quality of public services. Eduardo Montero is completing his PhD in economics at Harvard University. Originally from San José, Costa Rica, he graduated from Stanford University with a B.A. in Economics in 2010 and with a M.S. in Statistics in 2011. Montero’s interests are in development economics, political economy, and economic history. his research focuses on how variation in institutional arrangements, such as property rights regimes, affect development in Central America and Central Africa. Neggers and Montero will add to the Ford School’s strength in international development, joining a group of scholars that includes Susan M. Collins, John Ciorciari, Dean Yang, and Ann Lin. Below is a formatted version of this article from State & Hill, the magazine of the Ford School. View the entire Spring 2018 State & Hill.